Since the inception in 1910, Black & Decker has managed not only to create but also maintain its reputation as a reliable and quality brand in the power tool industry. In fact today, it is one of the most trusted brands in that market. Therefore, looking out for its chainsaws is certainly a rational decision, as you are at least ensured of quality and reliability. Black & Decker already has a few strong chainsaws in its well-demanded collection of saws. However, there is a mix of both corded and cordless ones. These options are specially designed for those who are tired to face the limitations or disadvantages of gas models, such as harmful emissions, bulkiness, awkward rope pulling, and difficult maintenance. Even corded models come with the inconvenience of cord extension, which many professionals and even novices find it troublesome. If you, too, are of the same opinion, you would surely look for a cordless model from Black & Decker. 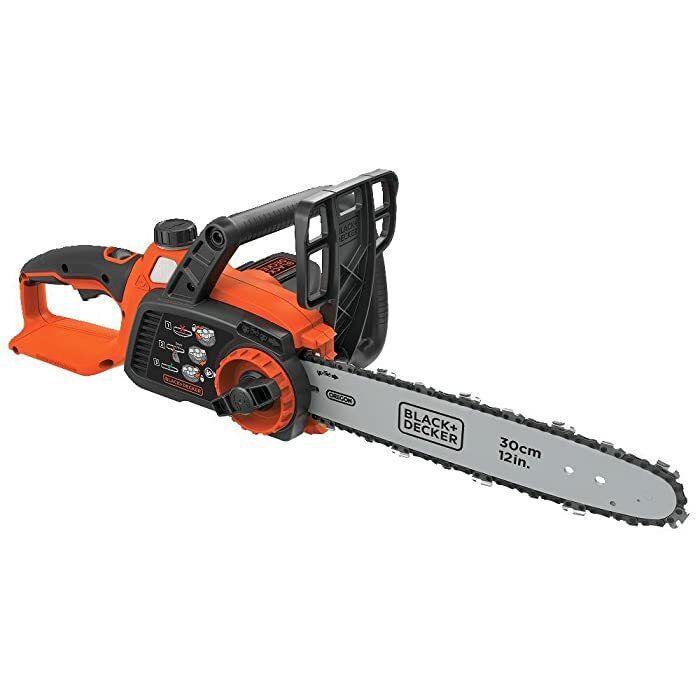 The LCS1240B as a 40v 12-inch chainsaw is perhaps the recently released model with great features and capabilities. It is true that many dislike the power and price limitations when it comes to cordless models, while liking the convenience. However, the convenience on offer, at times, justifies what you pay for the power. The LCS1240B cordless tool interestingly is getting popular for its perfect blend of power and portability. It uses 40v lightweight lithium-ion batteries offering almost five times longer usage, for longer lifespan. Similarly, there are more features that can make this model a right choice for you. Let’s explore them all! Designed by OREGON, the 12-inch premium bar and chain facilitates less kickback than any gas model. This is a plus point for anybody who knows how irritating kickback is! It is also responsible for delivering fast, clean cuts, which is also facilitated by minimal vibrations. The chain tensioning is free of tools, which means that the chain adjustments are not only quick and easy but also independent. Yes! They occur without any extra tool. This adds to easier operation as well as convenience of a customer, which is primarily ensured by a lightweight design for maneuverability, ease of use, and less fatigue. The tension adjustment is actually easy because of the well-designed diagram adjacent to the adjuster. This diagram is a plus point, as it helps in proper maintenance of chain tension, which is essential for a longer chain life as well as for the safety of the user. Moreover, there is also a guard for defending you if the chain comes off or if it kicks something back. This saw comes with an automatic oiling system that eliminates the need for manual oiling and priming. The system is responsible for non-stop lubrication of chain and bar, which is again a feature that adds to the overall convenience. Just like a corded chainsaw, this one also has a clear window that allows monitoring the oil level. Almost half of the bar oil is used while cutting two to five inch thick limbs of mulberry and sycamore trees for some 20 minutes. For this much time, there is no slow down in performance. While this is commendable, it does not relieve you completely. Because the reservoir is not a big one, you need to keep an eye on it at every 30 minutes while using the saw. However, the pro of using such a bar is that there is no need to pump it with that quickly wearing out plastic bubble. Last but not the least; the easy to fill oil bar is supplemented by a filter. This is something that many gas saws do not offer. Having such a filter eliminates the risk of quick dulling chain and costly repairs. Initially, you might feel a bit irritating to refill the oil at least twice just for one-time use. However, you shall not be disappointed in terms of performance. It may even appear to you that the oil is drenching all sawdust but this shall settle down nicely after some uses and even when the weather becomes cold. A single fully charged lithium battery in this saw can cut into firewood trees having the base of 10 to 12 inches. The long-lasting batteries of 40v also come with a power check feature, indicating the amount of battery life left. This means that you shall never get stuck in the middle of an operation due to zero power. The battery is even sufficient for large fallen tree pushing (12′). With 40v, you seriously obtain double cutting time as compared to a 20v powerhouse. However, the only drawback is that the large lithium battery will take almost 3.5 hours to get fully charged although it runs smoothly for 20-30 minutes for giving you straight cutting, as per the size of logs being handled each day. The lightweight body of the model features a wrap-around bale handle. Such a handle not only ensures boosted control as well as comfort but also less fatigue and more maneuverability. Consider this cordless chainsaw for small medium thick items. It is ideal for small branches and tree limb trimming, as you really do not put in any major effort. According to most existing customers, this Black & Decker chainsaw is perfect for light duty work done mostly by a suburban home owner, including smaller tasks, major pruning, and a single small to medium tree cutting.